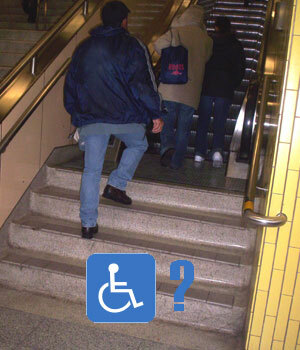 TTC stations can either be accessible, or not. Except for Christie Station, shown here. It’s neither not accessible nor accessible. It’s as if the TTC ran out of escalator: There’s an escalator that almost reaches the station floor, followed by a short flight of stairs. At the transfer point (no transfer required though), there’s a small platform in which to rest. What gives? Christie is different for several reasons. On October 15, 1976, a subway train caught on fire in the station, causing many of the tiles to be replaced. The train was a victim of arson, just before making one of its last runs of the night. It can be seen here. The fire was fairly significant, destroying four subways and closing a section of the Bloor-Danforth line for a number of days. This, however, did not affect the escalator completion (it in fact pre-dated it). So, without any further voice on the issue, chalk this one up to lethargic efforts by escalator architects. Unless there’s something we’re missing on the matter?